A decade ago, two Rochester, New York, pastors wondered: What would happen if the city’s PCUSA congregations moved into an uncertain future together, instead of separately and alone? The answer: Life, death and resurrection. Back in 2007, when the Rev. John Wilkinson and the Rev. Judy Lee Hay met regularly for coffee at the South Wedge Diner in Rochester, New York, they often talked about the plight of a growing number of the city’s churches from their denomination, the Presbyterian Church (U.S.A.). Wilkinson, the pastor of Third Presbyterian Church, and Hay, then the pastor of Calvary St. Andrew’s Presbyterian Parish, lamented the dwindling membership and financial decline at so many of Rochester’s PCUSA churches. Their own congregations were holding steady, but others weren’t doing so well. Two had already closed. Two others were barely holding on. Five were without pastors. They knew that the decline they had been witnessing wasn’t unique to Rochester -- or to the PCUSA. It had been happening across the nation and throughout mainline Protestant churches for decades. Both graduates of McCormick Theological Seminary in Chicago and both trained in community organizing, Wilkinson and Hay knew the importance of relationship building for any organization. They wondered: What would happen if Rochester’s PCUSA congregations moved toward an uncertain future together, instead of separately and alone? If your church is part of a denomination, to what extent does it act as an independent franchise? “Presbyterians have a connectional polity, but rarely do we live that out as congregations living toward their futures,” Wilkinson said. Whatever the future might bring, how could the city’s PCUSA churches work collaboratively in ministry, mission and outreach to help a city with serious social ills? And how could they help and support fellow congregations facing closure work through that decision and perhaps explore other alternatives? 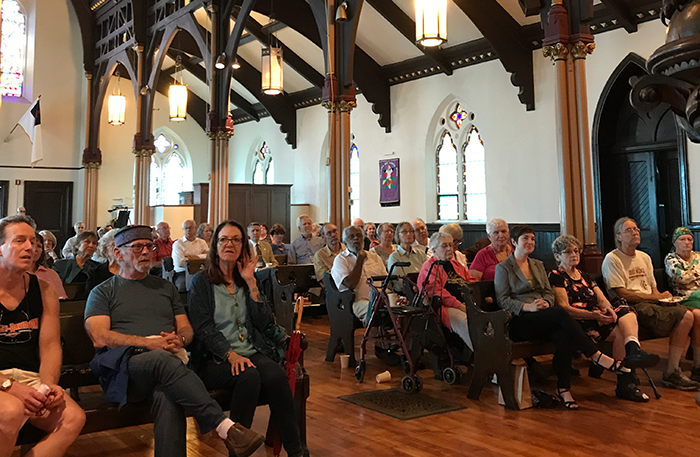 A year later, in 2008, Rochester’s then-existing 11 PCUSA congregations -- ranging in size from 150 members at Calvary St. Andrew’s to 1,300 at Third Presbyterian, and all by then with pastoral leadership -- launched Urban Presbyterians Together. Now known as Riverside Neighbors -- to mark the addition of several suburban congregations in 2016 -- this loose network of PCUSA congregations has spent the last decade helping one another collaborate in ministry and face the future together. What churches in your denomination are potential partners in ministry in your community? For many, that future did not turn out as they might have hoped. Of the original 11 congregations, two are no longer in the denomination and five have closed or dissolved, some in the past year. But with the help and support of the network of PCUSA congregations and the Presbytery of Genesee Valley, some of those have re-emerged in innovative ways or have otherwise been able to keep a form of ministerial presence in Rochester. “I’m a committed Presbyterian committed to our connectional polity, but I’m also an urban minister, so I care what happens to my own place,” he said. The coalition’s commitment to the PCUSA hasn’t changed, Wilkinson said, but how the congregations relate to one another and to the Presbytery of Genesee Valley has evolved. The congregations have always been linked to the presbytery, but now they’ve been building relationships with each other as well. The Rev. Amy Williams Fowler, the leader of the Presbytery of Genesee Valley and a strong supporter of Riverside Neighbors and its ethos of collaboration, agrees. “This is about building relationships from church to church, about being stronger, about being able to have a wider horizon of what needs and opportunities can be addressed,” she said. A crowd gathers in the former Calvary St. Andrews sanctuary for the launching of the ROC SALT Mission Center in October 2017. Those relationships -- and the ministries that can flow from them -- are greatly needed in Rochester. What was once the nation’s first boomtown, thanks to the construction of the Erie Canal, now has the country’s fourth-highest child poverty rate and New York’s lowest high school graduation rate. The city wrestles with structural racism, and continues to feel the impact from numerous downsizings by manufacturing industry giants Eastman Kodak, Xerox and Bausch & Lomb. 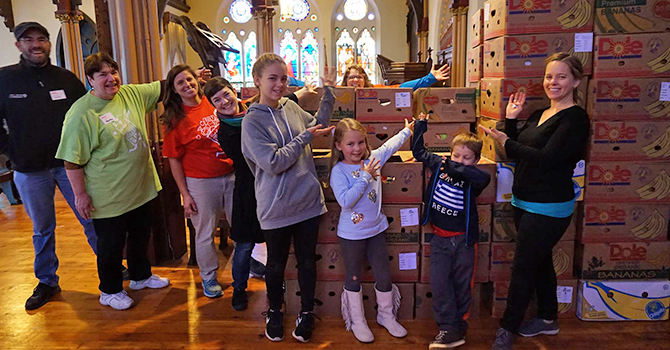 Over the years, the Riverside Neighbors network has helped foster relationships among the city’s PCUSA congregations, which in turn have led to several joint ministry initiatives. To help connect Presbyterians from throughout the city, the group at the outset hosted get-acquainted dinners for laypeople and monthly get-togethers for pastors. “It was really a support system for pastors who could say, ‘My church isn’t the only one wrestling with this particular issue,’” Hay said. To strengthen bonds with the community, the group held “The Big Lunch” on the first weekend of June every year, with each congregation hosting a neighborhood dinner at its own location. These and similar efforts were about building capacity, Hay said. “It was about conveying the message that Presbyterians are in the city, and that we’re committed to it,” she said. To what extent is your denomination -- and your congregation -- a visible presence in your city? In one of their most important accomplishments, the group formed Great Schools for All, a grass-roots coalition of churches, community groups, businesses and nonprofit organizations working to improve Rochester schools. Great Schools has been helping create a network of socioeconomically diverse magnet schools in the city’s school system to draw students from throughout Rochester and surrounding suburbs. The movement, which initially grew out of after-school tutoring programs sponsored by Urban Presbyterians Together, has gradually gained traction, and last summer, the Rochester Board of Education approved a resolution to consider developing a regional magnet program. But despite its success at forging relationships and helping congregations be in ministry together, Urban Presbyterians Together/Riverside Neighbors has not been able to halt the decline -- and in some cases, the closing -- of many member churches. Even so, some churches have worked together to find new ways to be in ministry. In 2014, for example, South Presbyterian Church, a historic 165-year-old church in southeast Rochester, sold its building to become a “church without walls,” with a variety of worship groups, outreach ministries, and educational and social opportunities in which members can participate. For the past two and a half years, South Presbyterian has been linked with New Life Presbyterian Church, often conducting ministries together. After months of discussion, New Life voted earlier this year to sell its building as well and become part of South Presbyterian, bringing with it the congregation’s own various ministries and programs. The Rev. Laurie Ferguson, a Presbyterian minister and consultant hired by Riverside Neighbors through a grant from Leadership Education at Duke Divinity, helped facilitate those discussions and similar ones among other congregations facing possible closure. Ferguson said she’s been impressed by congregations’ willingness to have difficult conversations about the future. How willing is your congregation to have difficult conversations about the future? For several years, two other congregations found a way to share pastoral leadership. After Laurelton United Presbyterian Church lost its part-time pastor in 2015, the Rev. Katie Styrt, who had been serving as associate pastor at Gates Presbyterian Church, stepped in and began splitting her time between the two congregations. That arrangement, in turn, forged other connections between the two churches. The Rev. Melissa DeRosia, the pastor of Gates Presbyterian, said the two congregations formed deep relationships that created space for empathy in a way that didn’t exist before. Where do you see the body of Christ moving forward in the world? But sharing a pastor wasn’t enough to prevent Laurelton’s demise. Much of Styrt’s ministry at Laurelton was about helping the congregation deal with its ongoing decline. Last month the congregation voted to dissolve, and its red-brick building has been sold. Styrt said the congregation met several times with Ferguson, and that those conversations were invaluable in helping Laurelton’s leaders clarify and process the tough changes that were ahead. Ministry continues at Calvary St. Andrews Church, as these South Wedge Food Program volunteers can attest. DeRosia said that such conversations are an important and necessary part of ministry for the church today. Sometimes, as other Riverside Neighbors congregations have discovered, resurrection can look very different from what’s expected. Life re-emerges in new shapes and forms. Last year, after months of discussion and analysis, the congregation at Calvary St. Andrew’s voted to dissolve, and the church held its final service on Easter. That was the congregation once served by Hay, the pastor who a decade ago, over coffee with Wilkinson, helped hatch the idea for Urban Presbyterians Together. Founded in 1856, Calvary St. Andrew’s had held its own and been a vital place of ministry during Hay’s 40 years at the church. But after her retirement in 2013, it went through a string of interim pastors and a period of decline. Typically, the presbytery would have sold the building. In fact, several potential buyers, including a group of investors who wanted to convert the space to apartments, made purchase offers. But Riverside Neighbors and others in the community lobbied against selling the church. Instead, they proposed using the space to launch a mission center that would tackle Rochester’s persistent poverty, education and race issues. They also wanted to continue operating Calvary St. Andrew’s long-standing food cupboard there. After study and discussion, the presbytery agreed. Calvary St. Andrew’s is now home to the ROC SALT Mission Center (ROC for Rochester, SALT for Serving And Learning Together), which includes several new partnerships with area social justice programs and the former Calvary St. Andrew’s food bank, now known as the South Wedge Food Program. Martha Cuthbert, co-director of the South Wedge Food Program, is grateful that the Calvary St. Andrew’s building will continue to be an important presence in the community. “It’s a rock in the neighborhood and something that would’ve been lost without so many people caring about this church,” she said. Looking back over the past decade, Hay said that Riverside Neighbors accomplished much. Still, the losses have been real and deeply felt. When Hay and Wilkinson first proposed their idea a decade ago, one of their goals was that no other PCUSA churches in Rochester would close on their watch. The closing of Calvary St. Andrew’s last year was “deeply painful,” she said. “Never in my wildest dreams would I have thought they would’ve closed the church I was at for 40 years,” she said. But she’s glad to see ministry continuing in new ways in her old church’s neighborhood. If your church is part of a denomination, to what extent does it act as an independent franchise? What are the benefits of being a “franchise”? Of being in a denomination? To what extent is your denomination a visible presence in your city? How specifically does your church manifest its commitment to your city? Where do you see the body of Christ moving forward in the world? What would that look like In your community?